Are you searching GESCOM Jobs Notification ???? If yes then here is good news for you. 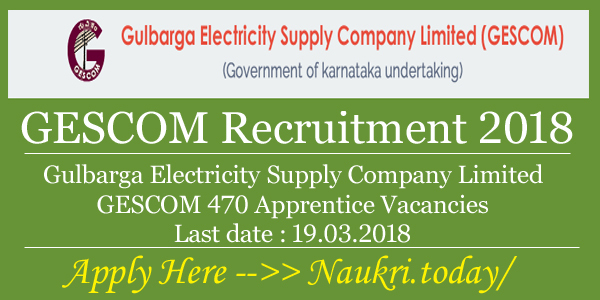 Gulbarga Electricity Supply Company Limited has issued notification of 470 Apprentice Vacancies. Applicants who are interested in GESCOM Recruitment 2018 can fill prescribed application form here till the last date. Closing Date of submit GESCOM apprentice Application Form is 19.03.2018. GESCOM Karnataka is inviting application form for filing up 470 Various Trade Apprentice Vacancies. This is great job opportunity for all the contenders of Karnataka State who are are Jobs In GESCOM. Submission of application form has been started from 07.03.2018. Appliers must read required qualification & Other details from here before submit GESCOM Jobs Application form. Rest of details about Education, Age, Pay Scale & Other you can collect from below article. How To Check Monthly Stipend, Application Fees & Selection Criteria For Apprentice Bharti ? How To Fill Application Form For GESCOM Recruitment 2018 – Apprentice Vacancies ? Here we read providing Distribution of GESCOM vacancies in the below section. candidates can also check more details from official notification. If you are going to submit form for GESCOM Vacancies then check required eligibility criteria from here for apprentice jobs. You can also get more information about Gulbarga Electricity Supply Company Limited Jobs form official notification. Candidates must have done ITI Course in Electrician Trade from any recognized Institute for GESCOM Apprentice Recruitment. More details about Education Criteria you can check from official notification. 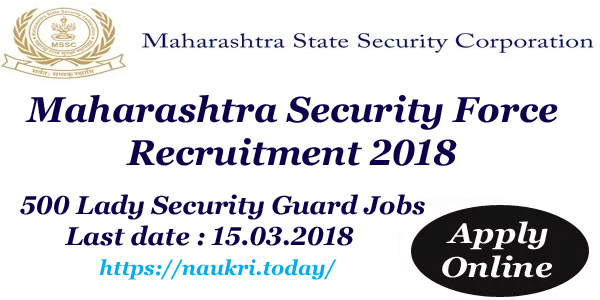 Minimum age of the candidates for Gulbarga GESCOM Jobs must be 16 years & upper age should be 40 years as on 19.03.2018. Relaxation in age for GESCOM Bharti 2018 is applicable only for reserved category candidates as per department rules & regulation. General Category candidates need to pay Rs. 100/- for filling GESCOM Apprentice Application Form. Reserved category contenders must paid Rs. 50/- as application fees for GESCOM Recruitment 2018. Selected candidates will paid Rs. 6250/- per month as stipend for GESCOM Vacancies. Applicants can check more details about pay scale from official notification. Candidates will selected on the basis of written Examination & Interview. To get further information like Selection criteria check the Official GESCOM Recruitment Notification. Keep stay with this page for more updates. Applicants who are interested & Eligible For GESCOM Apprentice Vacancies can submit application form here till the last date. Read the given below steps which is helpful for filling GESCOM Apprentice Application form. Now click on GESCOM Vacancy Notification link. Than fill all required information in form like Apprentice Reg. No. & Other Details. Now send the GESCOM Jobs application form correct postal address. Conclusion : GESCOM Recruitment 2018 For 470 Apprentice Vacancies. Candidates can fill application form for GESCOM Apprentice Vacancies on or before the last 19.03.2018. Check more information about Gulbarga Electricity Supply Company Limited Vacancies from above article. GESCOM Recruitment 2017 :- Gulbarga Electricity Supply Company Limited (GESCOM) is conducting the recruitment notification for 1840 Junior Line-men & Junior Station Operator Post. The candidates who are eligible and interested can apply for the application form through online mode on or before and the last date for receipt of application 29th April 2016. GESCOM, Karnataka has published the recruitment notification of 1840 Various Vacancy. The applicants who wants to apply should check the official website www.gescom.in. To get more detail information such as pay scale, age limit, selection process etc. is all given below. Name of organization : Gulbarga Electricity Supply Company Limited. Job location : Gulbarga, Karnataka. Total No. of Post : 1840. Education Qualification For Karnataka Jobs :- Candidate should have done 10th/ ITI from recognized Institute to apply for Junior Stations Operator & Junior Line-men post. Age Limit For GESCOM Vacancy :- Candidates maximum age should be 35 year and minimum age limit should be 18 years. Age relaxation should be applicable as per Govt. of Karnataka rules & regulations. For Junior Line-men Post : Candidate who belong to General category will be pay Rs. 200/- and who belong to ST/SC category will be pay Rs. 100/-. For Junior Station Operator Post : Candidate who belong to General Category will be pay Rs. 400/- and who belong to ST/SC category will be pay Rs. 200/-. Pay Scale :- Candidate who are willing to apply for Junior Line-men post will be paid Rs. 7350-150-8100-190-9050-240-10250-300-11750-360-15710/- and who are willing to apply for Junior Station Operator post will be paid Rs. 7950-150-8100-190-9050-240-10250-300-11750-360-16790/-. 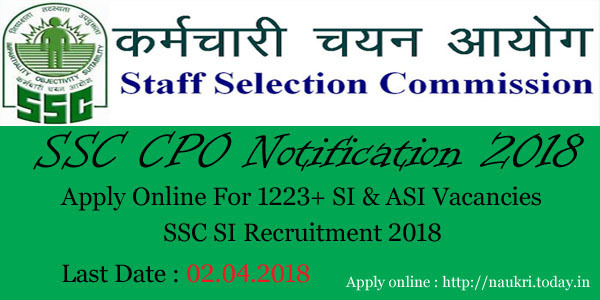 Selection Process :- Candidate will be selected for Junior Line-men (JLM) & Junior Station Operator (JSO) post on the basis of Examination & Interview. Candidate should log on to the official website www.gescom.in. Read all the instruction carefully which is mentioned on the site. Candidates should click on apply online. Recheck all the detail information before click on submit button. Candidate should upload scanned copy of relevant documents. Note down registration ID & Password which will be generate at the time of registration. Starting date for Submission of Online Application : 11.04.2016. Last date for Submission of Online Application : 29.04.2016. To Get Official Notification For GESCOM JLM Recruitment 2016. GESCOM Recruitment 2017 has issued for 1840 Junior Line-men & Junior Station operator vacancy. Eligible & interested applicant should submit the application form before the last date 29th April 2016.